Why Would you Sell Your Home During the Winter? OK, let's talk about selling your home. A lot of people have been asking us if they should list their property now, or wait until the spring when there are more buyers. Most people generally think that listing their home this time of year is a bad idea, because there are no buyers out there. Actually, there are a ton of buyers out there, especially with these low interest rates we have been seeing. At just over 4%, these historically low interest rates are an opportunity that most buyers have figured out they shouldn't pass up. Waiting for another decrease in interest rates doesn't really make sense, as they are expected by many experts do increase in the next year by at least 1.5%. That might not sound like very much, but could cost you an extra $100,000 throughout the life of your mortgage. We are currently at our lowest point of the year in terms of homes for sale. Combined with the fact that there are still a ton of great buyers out there, is great news for anybody thinking about selling their home. 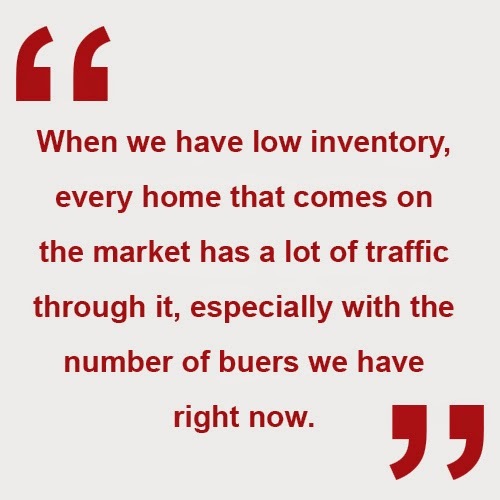 When we have low inventory, every home that comes on the market has a lot of traffic through it, especially with the number of buyers we have right now. The holidays are a joyous time, where we decorate our homes and create a warm environment for all of our holiday guests. This is great for the environment of holiday buyers as well. You will likely be one of the few homes in your area on the market. If you have every reason to sell but are planning on holding off until spring, think again. You could be shooting yourself in the foot by not taking advantage of the trends we are seeing right now. If you have any questions, feel free to contact us via call, text, or email. We hope to hear from you soon! Who is our Big Winner? We recently finished our Zillow review contest, where we had past and current clients write online reviews about their experiences working with our team. It was a great success, as we went from 5 reviews to over 30 reviews in just 10 days! This is great because it showed that you enjoyed your time working with us, and it will be out there for potential buyers and sellers to see to help them make their decision on who to hire. So, without further ado, our winners are... Jeff and Erica Poest! 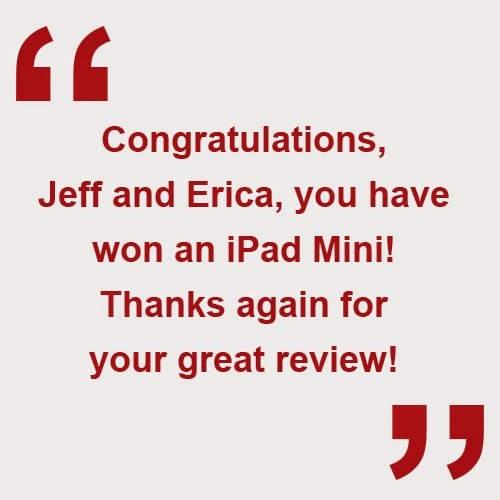 Congratulations, Jeff and Erica, you have won an iPad Mini! Thanks again for your great review! We will be doing little contests like this from time to time, so keep an eye out for the chance to win another great prize in the future. In the meantime, if you know somebody who wants to have a great real estate experience, be sure to have them give us a call . Referrals are the lifeblood of our business and we can't thank you enough for helping provide us with clients who want to experience a high level of service. If you have any questions, don't hesitate to give us a call or send us an email. We would be more than glad to help. We are now in a 2nd year of improving market conditions. With interest rates right around the 4% mark, now is a great time to buy a home. Our market is one of the most affordable markets in the country. When determining whether we are in a buyers or sellers market, the main variable that comes into place is the absorption rate, or how long it would take to sell all the inventory we have if no new homes came on the market. Right now, we are at 4 months. This actually puts us in more of a balanced market than anything else. It's not a hot seller's market, but there is not enough inventory for it to be considered a buyer's market either. In my opinion, pre-approval is about as important as the decision to buy a home. When you decide to sell your home and purchase a new one, you have to be pre-approved because if we sell your home quickly, you won't be able to get a new home right away. When you are deciding on the right agent to hire, throwing in a question like "How long have you been in the business?" or "How well will you negotiate for me?" will give you insight to an agent's experience, skill, and strategy. The more you have been in business, the better you are at negotiating. A strong negotiator is invaluable. When you prepare a home for sale, you need to stop looking at your home as your home and start looking at it like a home you want to sell. 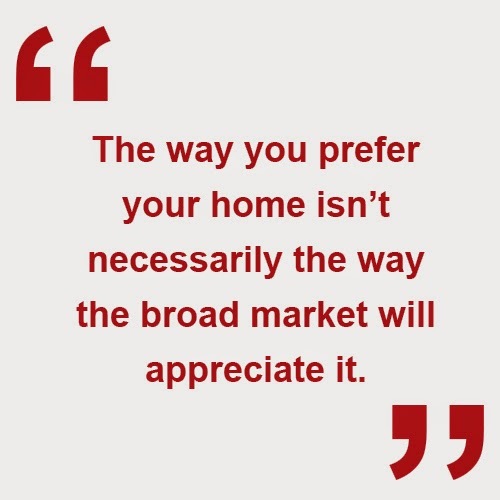 The way you prefer your home isn't necessarily the way the broad market will appreciate it. Thanks for letting me share some of these tips with you today. If you have any questions at all, feel free to give me a call or send me an email. I would be glad to answer them for you. Here we are, the fall of 2014. The leaves outside are starting to turn and we want to give you an update on the Grand Rapids real estate market. A lot has happened this year as we head into the 4th quarter. We are going to recap you on what's been happening, and give you an idea of what to expect in the near future. For the first 3 quarters of 2014, the Grand Rapids market was very healthy. Home prices have escalated, but not as dramatically as they did in 2013. We have seen low interest rates, as well as low inventory as we head into the latter part of the year. 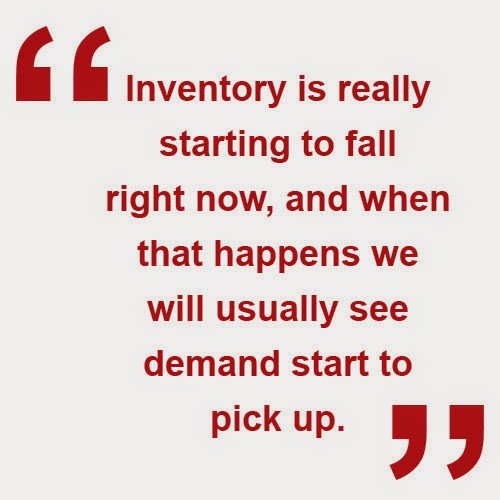 Inventory is really starting to fall right now, and when that happens we will usually see demand start to pick up. As for mortgage interest rates, all the information available to us points that yes, they are going to rise very soon. We talked to some mortgage professionals and we are looking at about a 1% increase in the next year. People don't realize how low that really is and what it means to take advantage of these low interest rates before they rise. According to Freddie Mac, a 1% increase in interest rates is like putting an extra $10,000 on a home over the life of the loan. If you are a first time home buyer, rates won't be like this for long. If you are a seller, inventory is dipping and soon, we will see some increases. If you have any questions about our market, don't hesitate to reach out to us. We would love to help you out. You've probably heard the recent news that internet home search giant Zillow has purchased its biggest competitor, Trulia, for $3.5 billion in an all stock deal that's designed to make the combined entity the largest of its kind in online real estate advertising. These companies help sellers and renters find information on homes, but that is not their source of revenue. Nearly all their revenue comes from advertisements. They charge agents and professionals to place listings on the site and have key placements along the side of the page. Not every agent does it, but a lot of them do and Zillow and Trulia get a lot of revenue from those advertisements. This is a strategic move by Zillow. As more and more people start house hunting on the web, Zillow will be by far the largest site to go to for information. A lot of people are afraid that the online industry will eventually eliminate the need for an agent's services. Zillow already has most of the same listings that they do and more and more people are wanting to conduct all of their business online. We feel that the relationship between Zillow and real estate agent's is mutually beneficial. On one hand, these sites provide the same listings that agents have from the local MLS, but on the other hand, agents are profiting off these sites because they attract buyers and sellers for them. Zillow wants our listings, we want their buyers. So will Zillow replace traditional real estate brokers? probably not. The truth is that most buyers and sellers want a professional to guide them through the process of buying and selling. The internet will forever increase the flow of info to buyers and sellers but simply can't replace the relationship part of the process. Technology will evolve the way real estate is done, but we can't imagine a day where a home buyer or seller will want to opt for a completely online home buying or selling experience. There is just too much complexity involved with not being able to pick up the phone and get a hold of each other and call the agent that you are working with. If you have any questions about this buyout, or about real estate in general, give us a call or send us an email. We'd be happy to answer any questions you may have. We had a pretty awesome experience. The stager came out and told us what to do to the house from putting an extra coat of paint on to suggesting we store some of our stuff offsite to make it look presentable. I think that really helped out a lot especially since the first day it was on the market, someone came through the house. One thing we get asked about a lot by prospective home buyers is the importance of a good credit score. Having a good credit score is the starting point of getting a home because you want to take care of your financing first before anything else. Your credit history is a compilation of all the pieces of your financial history. It includes every credit card you have ever opened, all your debt, loans and debt repayment history. Other information that impacts your credit score includes whether you've payed back credit card companies on time, filed bankruptcy, if a court has ordered you to pay a loan, or a debt has been deemed noncollectable. All of this information stays on your credit history and affects your score. If you have had money problems, or have failed to pay back loans in the past, you are a greater risk to a lender and more likely to be denied a loan. If you have bad credit, or are just starting to build it up, here are 5 simple things you can do to improve your score. One small card or loan can get the ball rolling for you and start building your credit score. By doing this, you demonstrate to lenders that you are fiscally responsible and less of a risk in giving a loan to. This is one of the most important things you can do. By paying on time, you are showing the lender that you are disciplined and responsible enough to make payments on time. This is another demonstration of fiscal responsibility that will prevent you from overspending on your limit. One way to build a positive history is to make sure you know what information is being reported. We recommend you to visit the free, online service AnnualCreditReport.com once a year so you can see how your credit score is being rated by the 3 big credit reporting agencies, Experian, Equifax, and Transunion. If you have any question at all about how to maintain or build your credit score, or any questions about real estate in general, please don't hesitate to contact us. There are currently 2,439 homes for sale, accounting for a 13% decrease from last year when there were 2,900 homes on the market. We are seeing trends of very low inventory and very high demand! In the first quarter of 2014, there were 1,895 homes sold which accounts for an 18% decrease from 2013 when there were 2,306 homes for sale. The average time a home spends on the market in the first quarter of 2014 is 69 days, as opposed to 71 days in the first quarter of 2013. The slight 3% difference is normal and indicates a healthy market. The absorption rate in the first quarter of 2014 was 25% - anything above 20% indicates a “seller’s” market. The slightly lower sales are nothing to be concerned about – we faced a tougher than normal winter, which put sellers about 30 days behind from when they actually should sell. If interest rates remain in the mid-4% range, expect the market to break loose. If you have any questions or would like further clarification, please feel free to call or email me. Thanks and have a great day! I get asked nearly every single day about pricing. Clients always want to know the best strategy to get their home priced correctly, so due to popular demand, I will now be revealing how this can be accomplished. A lot of people often get pricing wrong, and it's either due to bad advice from an agent or sellers want to start at a high price and reduce later on (which typically doesn't work). When your home is priced right from the very beginning, you capture the attention of more online buyers. Most online home searches have price brackets, so after you do a comparative market analysis or a competitive market analysis, you can find that perfect range that will attract buyers to your property. If you've found the optimal price range for your home, it will do a few different things for you. You will attract more buyers: The more eyeballs on your home, the better. This increases showings, which will hopefully increase the amount of offers on your home. If all of these things happen, you have a great chance of getting top dollar on your home. If you price incorrectly, buyers will pass on your home and it will become stale. People will typically think that something else is wrong with the property because it's been on the market for so long. This is a death blow to your home selling endeavor, because once this happens you are very unlikely to get a good price for your property. Also, your overpriced home will act as a justification for buyers to purchase another home.Because your home is badly priced, when they see a property that is priced well they will likely buy it. So in this case, by pricing your home incorrectly, you have helped to sell another person's property. Pricing your home high to begin with and then going low lacks velocity: What I mean by velocity is that you want your home to make a splash on the market when you list it for sale. It needs to be priced attractively to draw people's attention. If you price it too high it will hit the market flat and you will have missed your big chance to draw lots of buyer interest. Don't forget about appraisals: If you have managed to get a buyer to put down an offer for much more than what your property is worth, don't forget that you still have to appraise it. If your home doesn't appraise right, you could lose a sale. This is why it is important to consult with a realtor on how to accurately price your home. When you are priced attractively, staged correctly, and marketed aggressively, then you have the perfect formula to sell your home at the highest price possible in the least amount of time. Ultimately you should view your home's price as its most important marketing tool. You can attract buyers with a good price and then make them fight over your home, which should then drive up the price. If you would like to learn more about how I can help to sell your Grand Rapids home for top dollar using my other strategies such as staging or marketing, feel free to contact me. I am always here to help you. A lot of my clients have been asking me this, and I think I have a few great reasons for you to invest in real estate. Low Home Prices & Low Interest Rates: Interest rates are lower than ever, and so are home prices. These two factors are almost never both so low. Usually you see high prices and low interest, or vice versa. This is why now may be the best time ever to become a real estate investor. The Economy is Turning Around: The economy is on the rise, so if you have the financial wherewithal to invest right now you will be glad that you did in 5 years' time when home prices have shot back up. Also, it will be tougher to invest in the future when the market is saturated with heavyweight investors. Money is cheap to borrow: As I said before, interest rates are extremely low right now. With the combination of low home prices and low interest, it's hard to tell you a reason not to invest in real estate. Really what I would tell anyone to do would be to find an experienced real estate agent and have them find you some promising properties. Find a relational broker that you can refer to again and again for more leads and more properties. Finding someone that you can align yourself with and also who knows what they're doing in the investing arena can really take you pretty far in the business. Selling in the Winter: List Now and Face Less Competition and Increase Demand for Your Home! January and March creating a low inventory environment. If you’re a seller that is ready and has everything lined up, it would be a great strategy to get ahead of the market. On the contrary, sellers who list in the spring may have nicer weather, but also face more competition. This could be 2-3 times more active listings that they would be competing with! By listing your home in the winter, you have less competition to face which in turn increases demand for your home. There are personal preferences that may also factor in when the right time would be to sell your home. This could be certain features of your home that show better in the spring or waiting until school gets out, just to name a few. There is really no bad time to be on the market! If you are thinking about selling your home at some point in 2014, give us a call at (616) 942-2449 or send me an email at kevin@yoderteam.com. Thanks and have a great day! Today I wanted to give you an update for the Grand Rapids real estate market. Before I begin, I wanted to point out some links on our blog that could be very useful to you. There is a free home seller value report along with a free MLS home search. If you have a few minutes, take a look at them! I hope you find a lot of value in them. The market is Grand Rapids is weighed more towards the favor of the sellers. We can tell the status of the market by looking at the absorption rate. If the absorption rate is anything higher than 20%, we are definitely in a seller’s market. Anything under 20% would be a buyer’s market. How we find the absorption rate is done by calculating how many homes are sold in a particular amount of time and divide that by the number of homes that are for sale at the end of the particular amount of time. The absorption rate gives us a great baseline of where we are in the market. Current inventory levels in Grand Rapids are at about four months.Interestingly enough, this same time last year we saw the same levels of inventory. What we saw heading into the year was a very early spring market. Inventory levels dropped into the three month range combined with favorable interest rates made for a strong spring market. With everything available to real estate agents today in terms of tracking and trending, we expect to have another strong spring market as well. If interest rates remain favorable, this will allow inventory to drop and give us a strong start to spring 2014. This is very exciting! If you or anyone you know is looking to buy or sell a home in the West Michigan area, give us a call at (616) 942-2449 or send me at email atkevin@yoderteam.com. Thanks and have a great day!